I’ve taken a little time recently to evaluate a few of the remote control software packages on the market so that I can cater for the needs of my family, friends, IT support work and also the growing number of computers at my church which I support. In my mainstream business, we use Kaseya for managing our clients needs and we’ve got over 5000 deployed agents with it. It’s a solid product but not cost effective for my specific requirements for personal use (no offense to Kaseya but it’s more than I need for this environment). I took a look at a number of packages with the aim to fulfill these key requirements. Must be extremely cost effective – note I didn’t say Cheap. I won’t go into the list of packages that I evaluated here, but I settled on Splashtop for my needs as it already fills 8 out of the 9 requirements I identified. First up let’s start with the pricing as this was a big factor in the decision. Splashtop Remote Support is the package I’ve selected, and it starts at US$199 per year for up to 50 computers. That pricing is for the Remote Support Basic package. They also have a Remote Support Plus which I’ll talk about later. Now the Remote Support Basic package gives me the ability do remote control of computers quickly and easily from my Windows PC, iPad or Mac. I can login as if I’m in front of the computer and do everything I would expect to do. The remote control experience is pretty slick, even running over slow DSL connections, I’ve found the response to be quite good. I’ve also had some fun with the multimonitor experience, and the client will resize the screen dynamically as you need. In multimonitor, you can choose to view individual monitors on your screen, or show all within a single screen. Security within Splashtop is quite good too. 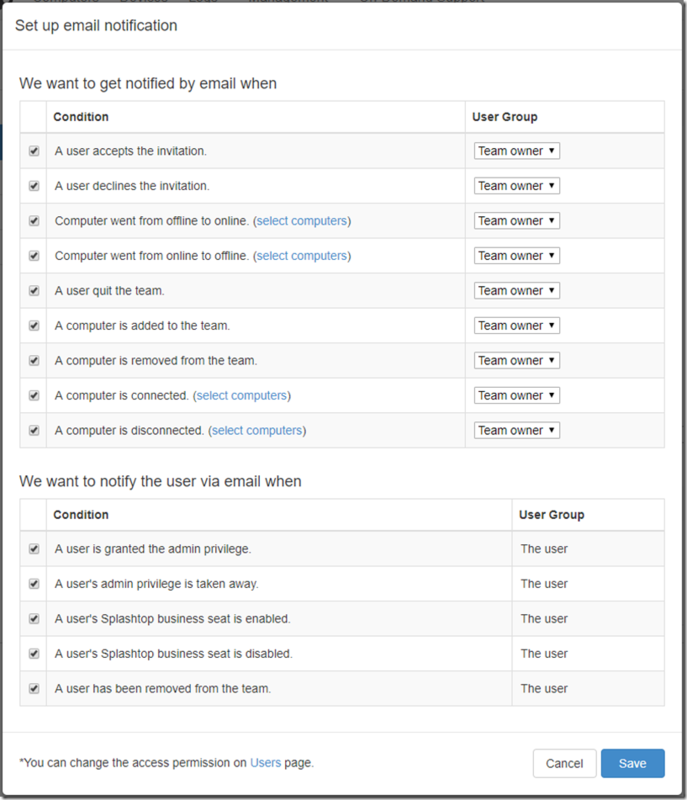 I can create additional users and it will email them the info they need to connect to the Splashtop web console. Other vendors will charge you additional fees for additional technicans, (ie users who can access the computers remotely), however Splashtop doesn’t. You can have unlimited technicians added to your Splashtop account. In this way it fills my need for additional remote users at no additional cost. They can also install the Windows/iPad or Mac console on their machines for quick access in future as well. 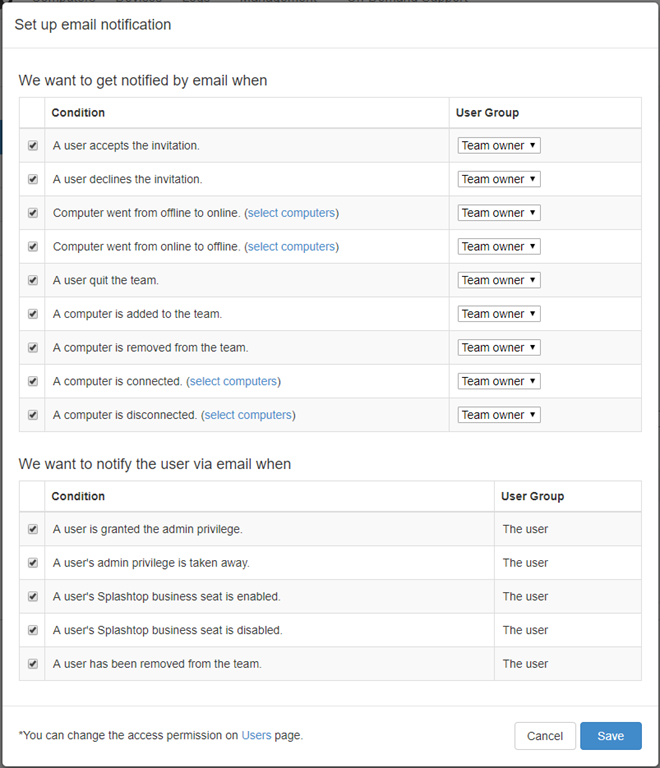 Users can be put into groups and then you can assign those groups to be able to access specific computers or groups of computers. In this way, for instance, I can permit our head of church production team to access only the church production computers, whereas the Church IT team can access all church computers, but none of my family and friends computers. There are no nested group facilities, which would be nice, but our requirement is simple and with proper naming of the computer groups, I can easily handle this. Here’s an overview of the grouping facility below as shown in their web console. There are also detailed logging facilities, which shows me as the owner, who has remotely accessed which computers, and for how long. This helps with accountability and whilst I have no questions over my team, it’s more so we can provide this information if needed for auditing purposes. There’s also logging of agent interactions with Splashtop which will help with diagnostics as needed. Deployment of the Splashtop agent is pretty simple. You can create a deployment agent within the Splashtop console which will permit you to set specific permissions for the agent and the default group that the computers will move into when the agent is installed. You can then email the agent exe file to the end user and have them install it easily, or email them a link and a code for them to enter which will effectively have the same result. I’ve had no issues so far with this, but am about to look into using Group Policy to deploy it to multiple computers more easily. I’ll let you know how I go with that. Tied in within Splashtop are some basic alerting facilities also. These are buried under Settings > Notifications. What you can do here is to select to send the owner or admin level users notifications of things like online/offline alerts. You can do this down to an individual computer level or a computer group level. The features above pretty much sum up what you get with the Splashtop Remote Support Basic package. I mentioned that they also have a Remote Support Plus package, which starts from US$299/year for 25 computers. For reference, the 50 computer package costs US$399/year. Again this includes all the features of the Basic Package but adds in a few extras including File Transfer, Remote Wake On Lan, Remote Reboot and what they call Attended Support. There’s a few more features too, but they weren’t on my hit list of requirements. I tried out the remote reboot, and wake on LAN features during the trial period and they worked well for me. Given my cost constraints however, have for the moment elected not go for the Plus offering, but I know I can upgrade to it later and pay just the difference in cost pro-rated against my current subscription which is fine. One of the benefits of the Plus package is that you also get an On-Demand Support license for a single technician. This permits a technician to guide a user to a website, and then enter a specific code. Once entered, the technician can remote into the users computer and resolve the issues. At the end of the session, the program is closed and the technician no longer has access. This would be great for the situations where we need to jump in quickly and fix something without first installing the agent. Again I tested this during the trial and it worked well for me. We’ll see if I the demand is there for us to need it in future. FYI – this is not a paid advert for Splashtop. I’m writing this as it’s a hidden gem and I’d like more people to know about it!